Perfect for Outreach! These handy Shirt Pocket sized Bibles are great for people on the go. They all easily fit into pockets, purses, glove boxes or any other small carrying case. Keep the Holy Bible near to you at all times! Some also include Psalms and Proverbs. Great as outreach gifts, they are available for purchase as single copies of in bulk by the case. Please note that due to their compact size, these particular Bibles have small print so they may not be suitable for people with poor eyesight. A pocket sized NVI edition with concordance and a bookmark. Easy to read text, this edition is a great gift or ideal for outreach or evangelism. Available singly or in bulk. A pocket-sized NVI translation of the New Testament (with Psalms and Proverbs). Available with imprinting and by the case, it is a great evangelical resource. 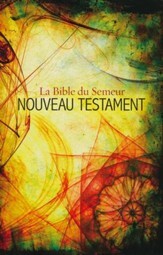 A French translation of the New Testament, this pocket-sized edition features maps, a dictionary, and footnotes. It is available by the case for affordable outreach.